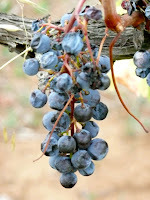 We happened to be in Umbria during harvest season. Le Velette Wine Estate was our home for a week and happened to be in full swing harvest mode. We witnessed winery employees bringing in the grapes from the fields and starting the wine making process. It was pretty cool staying on the grounds of the estate while all this activity was happening. We could literally walk into our backyard and taste the grapes. 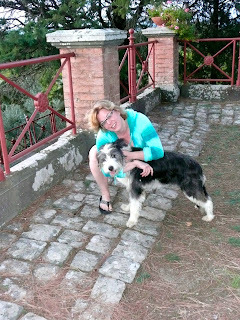 The grounds of the estate were stunning and we had views from the main reception house out across the valley and of the town of Orvieto set atop the hill. FloJo immediately fell in love with the winery dog who didn't really seem to have an assigned duty other than to entertain the winery guests. He was so loveable and had a bunch of puppy energy. FloJo was plotting how to get him home to America, however he was bigger than the suitcase. 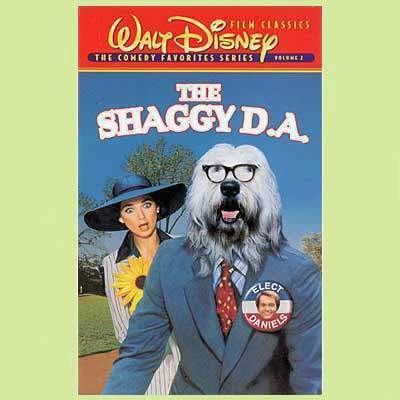 He was a miniature version of the Shaggy D.A. 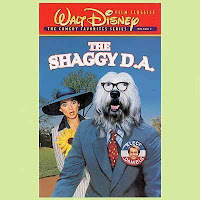 Maybe it was a lawyer, similar to Wilby Daniels, who had the same curse of turning into an English sheepdog. Perhaps trading in his law career for the grand life living his days on the Le Velette estate. We certainly had that same thought. 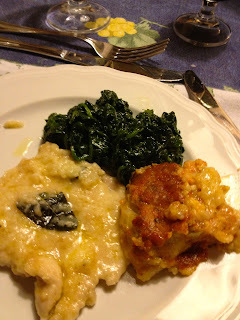 What was grand for us, and definitely one of the highlights of our stay in Umbria was having our very own Italian nonna (grandmother) cook us a few homemade authentic Italian meals. Meals does her an injustice please insert feasts in the previous sentence. 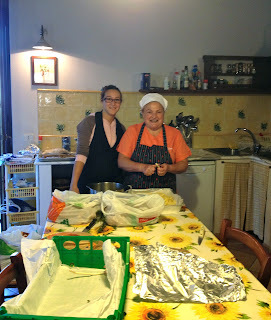 Nonna and her daughter Elenora came into our villa for a couple of nights, completely taking over the kitchen and magically concocting in just a few small hours literally enough food for a small Italian army. Nora (the daughter) was our main way of communicating with this mother and daughter cooking team. Nora actually speaks five languages (French, English, Spanish, Portuguese and of course Italian). Her mother definitely spoke Italian and really good hand gesture/sign language. The first night we were celebrating all the birthdays in the group with a special nod to our friend Betsy turning the big 5-0. We were all anxiously awaiting the food to be ready as the amazing smells began to waft out of the kitchen. We thought we could eat a horse--not literally (which apparently still occurs in Italy), but we ended up struggling to make it through the later courses. But, we get ahead of ourselves. 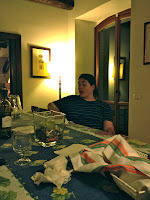 Our meal was just about to begin and we all anxiously gathered around the dining room table to try what authentic home-made Italian cooking tasted like. We started with probably the most traditional Italian appetizer bruschetta (l'antipasto, which literally translates to before the meal). The vibrant red tomatoes came from Nonna's own garden and tasted so fresh and flavorful than any other we had previously had on our trip. 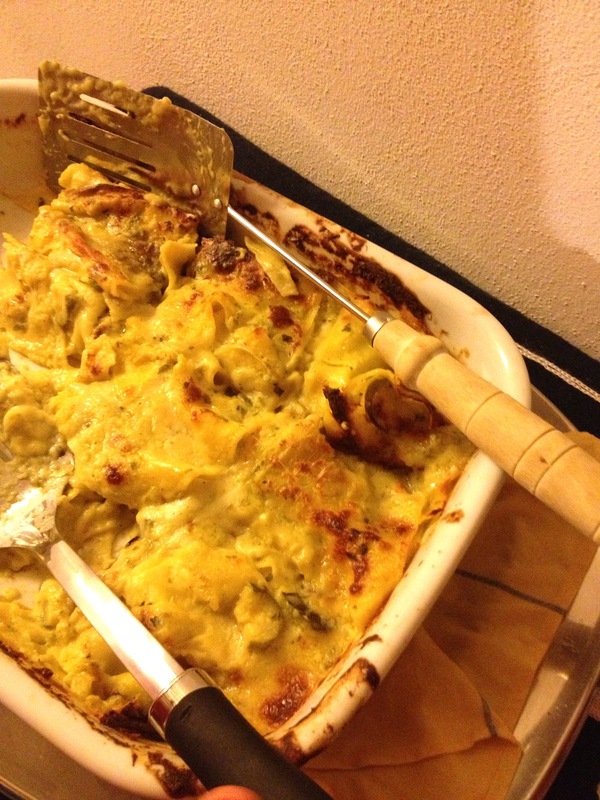 Such a simple dish, but it was extraordinary because of the exceptional ingredients. A dish called torta rustica followed, which was a rich, spinach and cheese tort again packed with a lot of flavor. 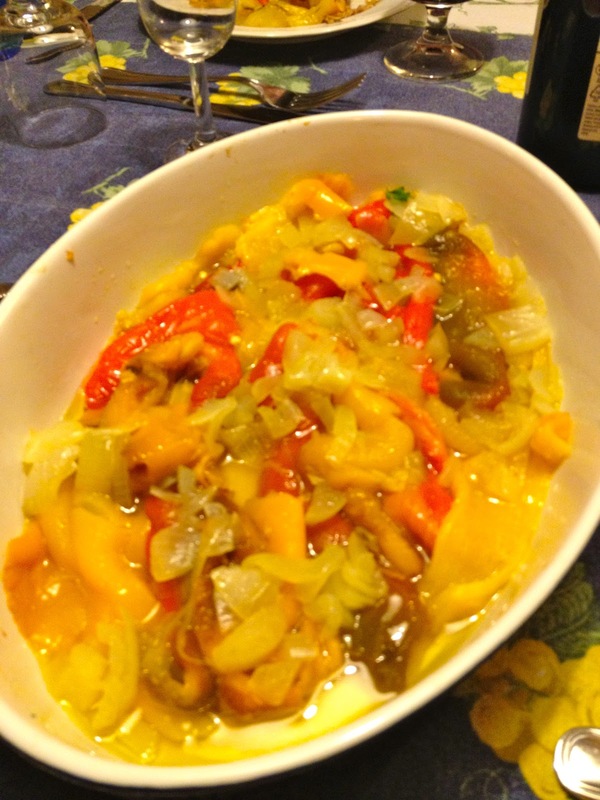 It would probably be considered the il contorno or side dish in a typical Italian menu. Nonna made it adorable with little hearts on top. Clearly demonstrating the love that our little Italian grandmother was putting into the meal. Il primo, or first course, typcially is a pasta dish. We had probably the best zucchini lasagna (lasagne zucchine e fiori di zucca) we've ever tasted. 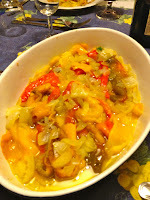 It was rich and delicious and again made with zucchini and pumpkin flowers from the chef's garden. We believe from what we could tell from Elenora's explaination that the zucchini and pumpkin flowers were key ingredients in the homemade pasta dough. It was truly a spectacular dish. By now, we heard alarms, which happened to be our full meters going off. But, the main course, il secondo, was up next and we knew by now it could not be missed. 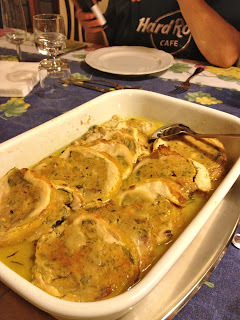 This is typically the meat course and we were treated to rotollo di pollo or chicken roulades stuffed with vegetables. 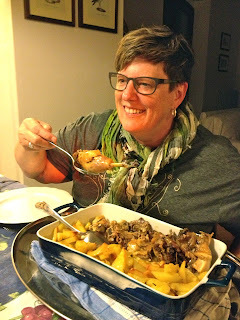 Just in case that wasn't enough another main course of arrosto di pollo or roasted chicken and potatoes. The chickens very recently been leading happy lives on Nonna's farm. Is it possible to get any more farm to table than that? 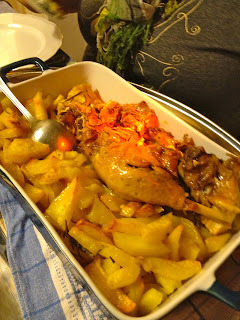 Again, chicken and potatoes seems so simple (and Italian cooking can be) but, it was so flavorful and the potatoes were roasted to perfection crispy on the outside and tender on the inside. Just when we thought we were done (and we couldn't eat another bite) nonna brings roasted peppers and a green salad. Poor little salad, we all took a token few bites so as to not offend our Italian food fairy godmother, but we had zero room left. 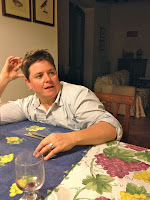 With the meal we shared several bottles of Le Velette's Gaudio wine. Cecilia (co-owner of the winery) brought this over and said she thought it would be a great pairing and birthday present because the meaning of the word gaudio in Italian is joy. Joy from past birthdays and wishing all the participants and birthday girls joy in the future. After waiting for our Italian feast to digest we came back to the table for dessert. 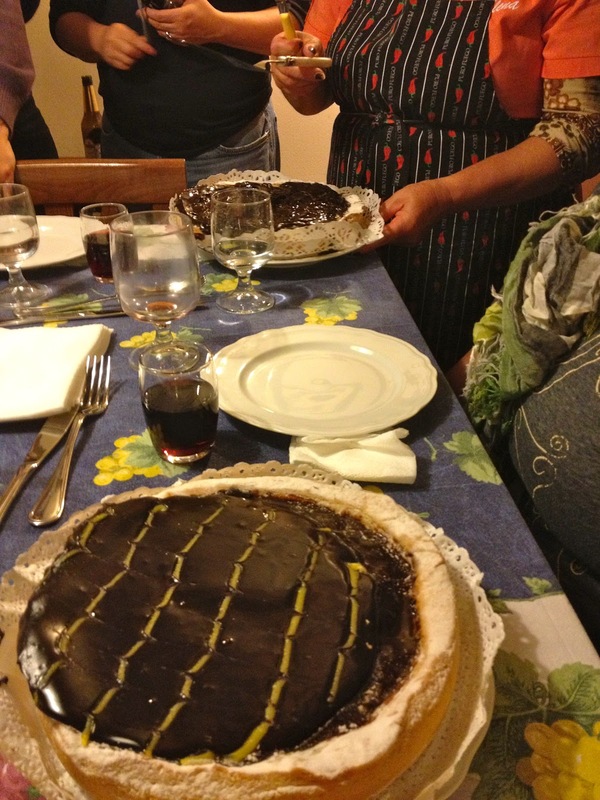 It was a specific cake Cecilia told us was a must have from the nearby town of Orvieto. The cake had a chocolate ganache frosting and was soft and spongy. We aren't quite sure what the flavors were, but by then we were in a food coma. We sang happy birthday and celebrated our last night of having the whole gang together as some travelers were heading out in the morning. 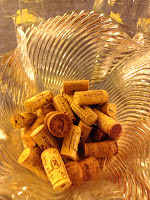 Another perk of this night as part of the dinner fee (which was less than $40/pp) it also included dishwashing. So nonna and Nora did the dishes and then wished us good night. We were all so excited by meeting such wonderful people and being able to partake in this amazing feast and celebratory night, which was capped off by watching a movie of Betsy's fifty shades (or years) of life. 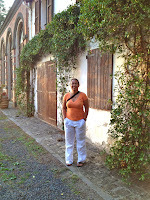 After our day trip to Montalcino (link to blog) we cruised home and made it just in time for feast #2. 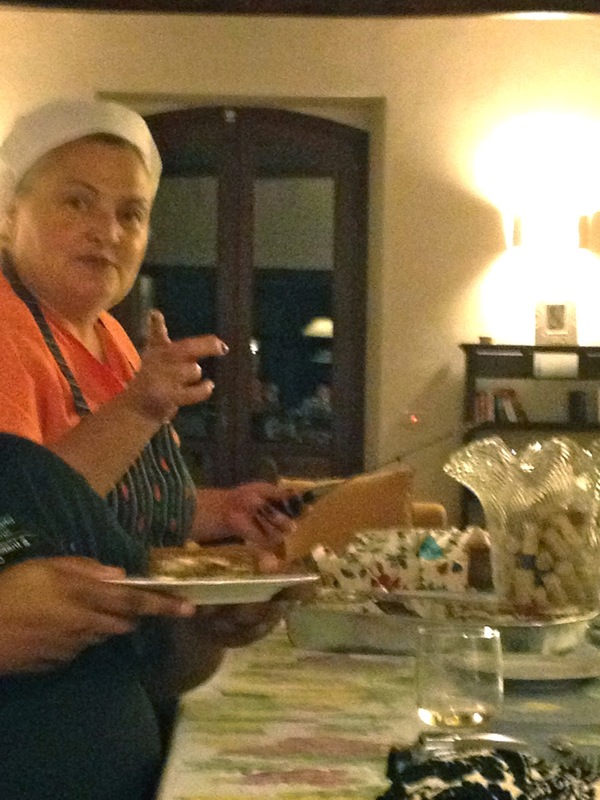 Our guest chefs had already prepared the meal by the time we pulled into the villa driveway. Nora informed us that she had to leave mid-meal this night, so we were on our own with Nonna who did not speak but a few words of English. We weren't too worried as food can be an international language. Janine and Daisy had stopped over in Paris on their way to Umbria and surprised us all with a champagne toast of Billecart-Salmon to start the evening. What a great surprise and start to the evening! The primo course was Ravioli Burro e Salvia. 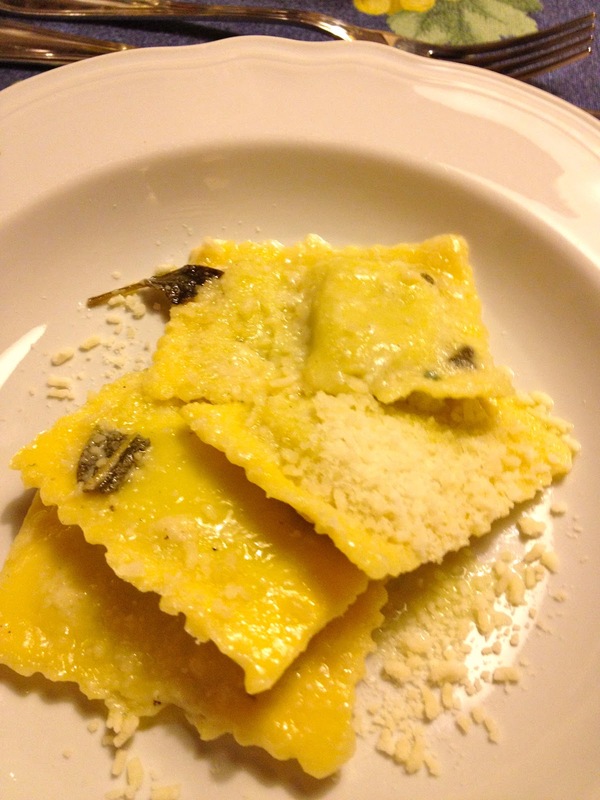 Delicate homemade ravioli stuffed with spinach, ricotta cheese cooked in butter and sage. The homemade pasta was incredibly soft with the richness of the butter and sage. It certainly was a delightful way to start this second night's line-up. Although, we knew we had many courses left, it was hard to stop eating these little pillows of joy. Il secondo course was up next and was a delightful turkey dish served with parmesan cheese and sage and cooked in olive oil. Simplistic again in nature, but so rich, decadent and comforting after a long day of traveling. Everything was served family style and it was a great experience passing this amazing food around the table. At this point, we were on our own trying to communicate with Nonna. 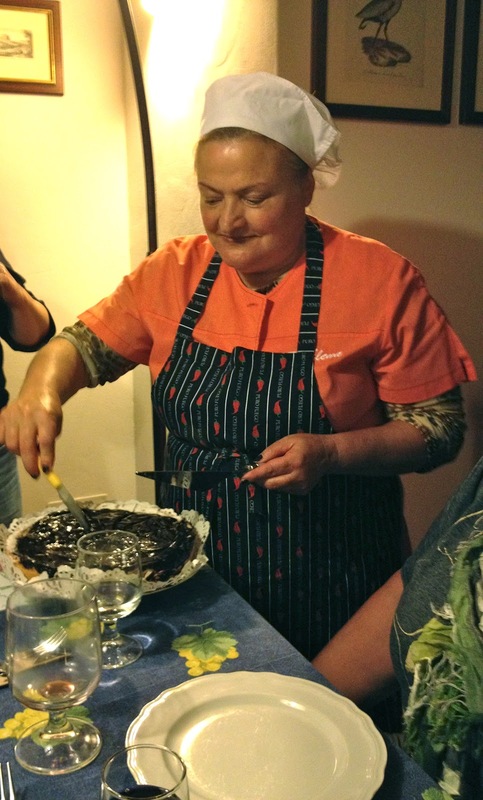 She was not only the chef, but also our waitress. We started trying out different languages and come to find out she knew some Spanish so we communicated in Espanol. 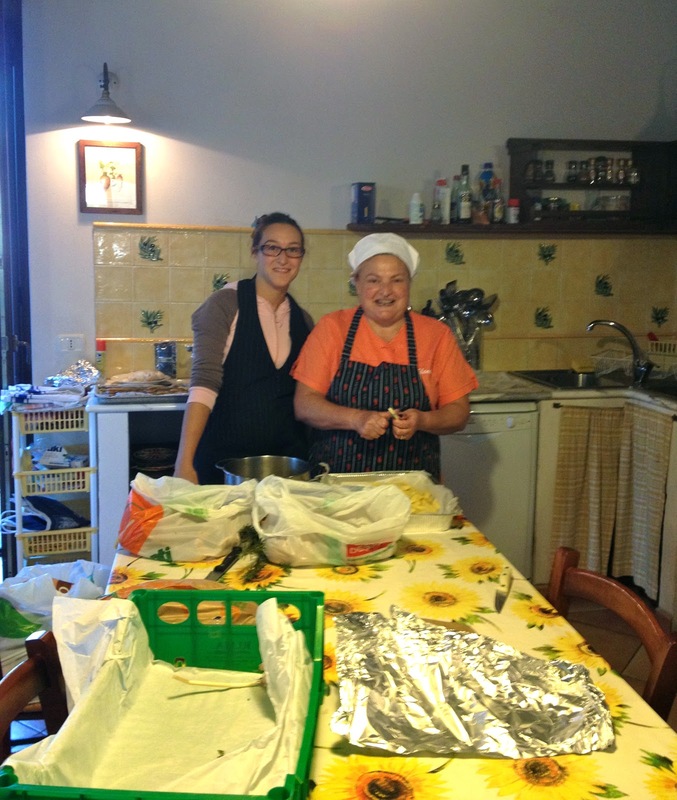 Nonna had worked in restaurants most of her life, but now cooked for travelers and or local events and of course her own family. She prefers using ingredients from her own farm and garden and they certainly made a big difference pumping up simple to incredible stature. We asked her if we could take her home to Seattle with us because now we were all hooked on her food and cute personality. We crafted a plan to use our frequent flyer miles to get her to America and then plan a pop-up Italian dinner where all the guest would be wearing white. 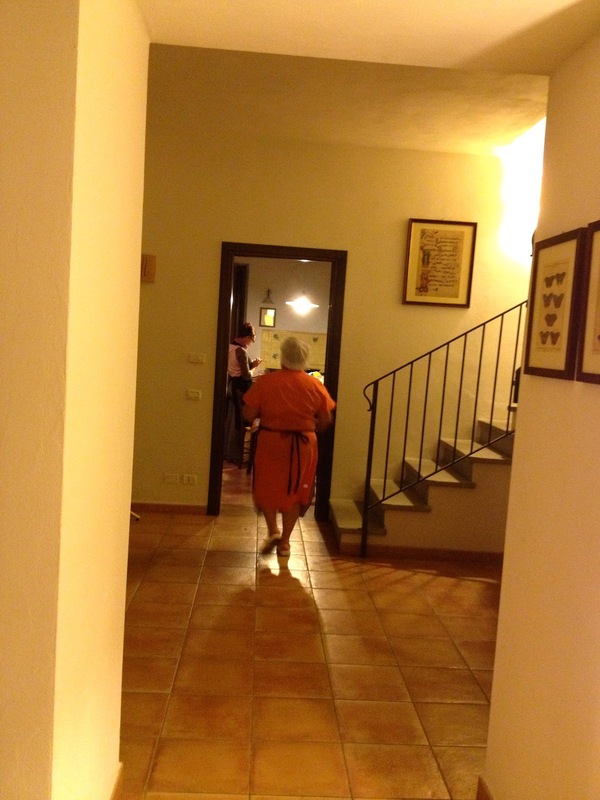 Watch for that in 2013-- Nonna comes to America! 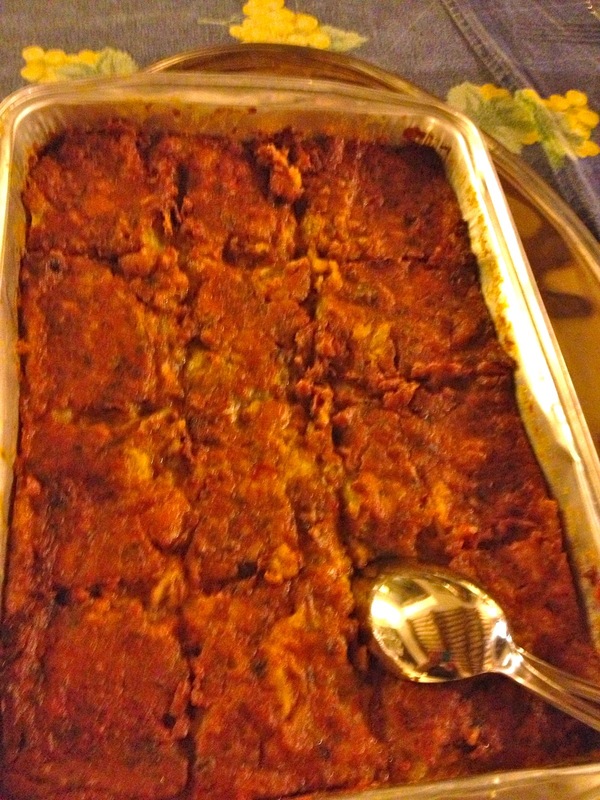 The meal was not done however, and it continued on with the next course something similar to our eggplant parmigiana. Nonna called it melanzane alla parmigiana. 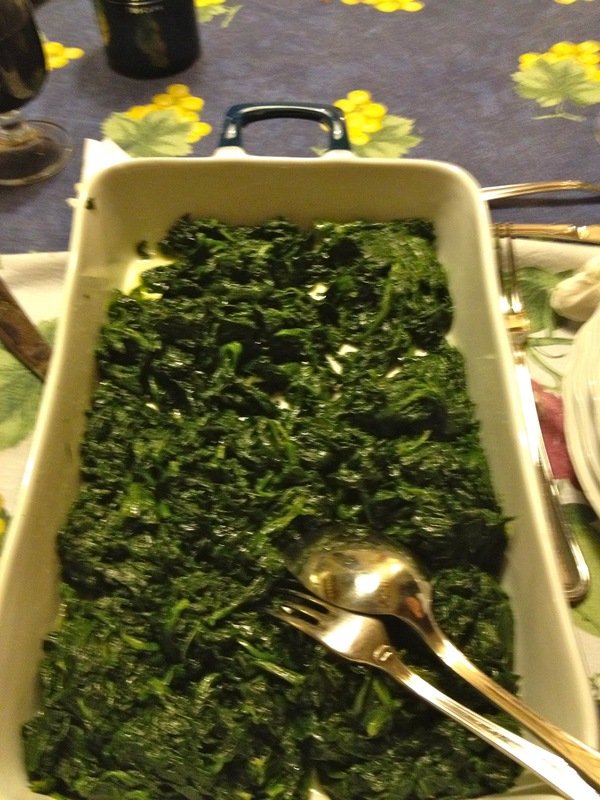 We also had fresh spinach cooked in olive oil. We were all stuffed like a big, fat eggplant at this point. But, when the best thing of the entire evening was brought out and placed in front of us we knew we had to press on and eat. Homemade tiramisú was the exclamation point on this back-to-back two evening food extravaganza. The rich dessert had savoiardi cookies which means from Savoy in Italian. The cookies were created to mark the visit of the King of France to the Duchy of Savoy (which was a state of the Holy Roman empire located in the northern Italian peninsula). We know these cookies as ladyfingers, but they have various names in different countries (read more here). Our friend Dana took one bite and said, "Ewww this tastes like coffee." 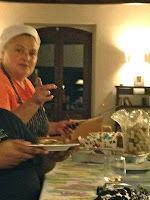 We all laughed and commented that espresso is normally a key ingredient in tiramisú. The dessert was amazing, but we couldn't eat very much of it because of how full we were. Our friend Kenna was smart and took a walk outside under the full moon to make room for some more of the delicious Italian dessert. 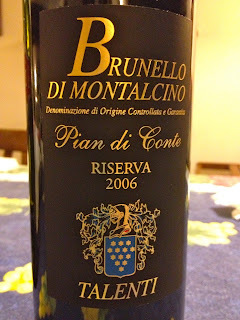 Dessert was paired with a bottle of Brunello di Montalcino from our trip there earlier the same day. 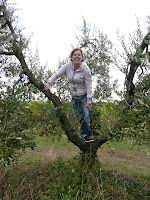 It was a great way to celebrate the amazing food, fun and friendship we had all experienced together this week in Umbria. Vivere la vita con gusto e divertimento!